If you own a poodle, you will know trimming your dog’s fur can give him a fun and beautiful style. Doing trimming at home can help you save some money. Also, it is also an opportunity to bond with your Poodles. 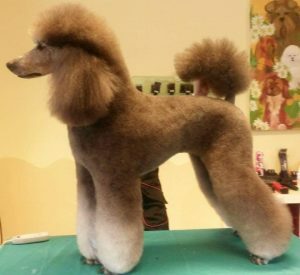 Nowadays, there is a lot of clippers for poodles available on the market. We’re here to help you choose the best clippers for poodles. Keep reading this post to get our sharing. Actually, poodles come with a different type of coat compared to other dogs. In fact, they have long and curly hair. You can get many cheap clippers for curly hair at a pet store. In addition, these dogs come with several different lengths of hair. It’s a good idea to choose a clipper with multiple attachments. You should choose ones with different blades sizes so that you can handle all of the hair lengths properly. Many pet owners don’t understand why they can use human clippers for their furry friends. A clipper comes with 2 main parts, including the motor and the blades. They are not the same between dog clippers and human ones. Human clippers are designed with slower motors. It’s easy to understand that. Dogs have more furs than humans. Therefore, human clippers are not able to get through your dog’s fur. On the other hands, human clippers have thinner blades than the dog ones. If you use a clipper with thin blades, it may be clogged with your pet’s hair. If you don’t hold the clipper right, both you and your dog can get an accident with the skin. So, it’s important to buy a clipper designed especially for your dog. There are some vital things you need to think about when choosing clippers for your poodles. Look for dog clippers with multiple speed options, you can easily trim different body part of your dog. However, its highest speed must allow you to cut through your poodle’s hair. In order to handle different lengths of dog hair, choose a product with different blade sizes as well as attachments. If you choose a corded unit, look for ones that its cord is long enough to move around your pet. You can also choose a cordless clipper. However, it requires you to charge and replace batteries. If the clipper makes the loud noise, your dog may feel spooked. So, it’s best to buy a quiet motor so as to keep your dog calm during the grooming process. The fact is that a dog clipper will become hotter due to the friction on the blades. However, this process happens faster in some of them than others. Thus, you need to buy a product that can’t heat up too fast. You may have to take about 2-3 hours to groom your dog. At that time, you have to hold a heavy equipment on the hand. So, we recommend highly to choose a lightweight clipper. Then, your job will become easier a lot. When using a dog clipper, we can’t avoid that its blade becomes too hot due to the friction of them. However, don’t worry! We have many things to do to combat this problem. Some products now are made from ceramic while most of them are made of stainless steel. For ceramic clippers, they don’t become as hot as fast. However, these products are not as strong as others. The first important step you need to do is choosing a good blade so that your dog won’t get burned. Next, you need to care for the blades as well as clippers. It’s essential to clean them regularly. Last, it’s a great idea to bathe your dog before you groom him to avoid getting burned. This is actually an excellent way for pet owners. Poodles are grown as water retrievers. So, they need to be groomed for activities related to the water. If you choose a traditional hairstyle when grooming your poodle, it’s essential to get several different blade sizes for various length. Depending on the length of hair, you need a specific blade. If you choose blades with an F, you can easily put the touches on your poodle. If you want something for stronger and faster, we recommend you to look for regular split-tooth blades. However, you need to use a finishing blade after that in order to up the coat. For those who are looking for a clipper for larger standard poodles, it’s highly recommended to choose blades coming with a T option. Sometimes, you also need a help from a comb. It helps to reach a slightly longer trim. Depending on the style as well as the length you want to give your dog, you can choose the suitable blades. Many owners choose a set of grooming shears. They ensure to give you perfect final touches. Besides the size of the blade, you need to also think about multiple speed options. If you want to get a safer grooming, choose clippers with lower speeds. They are great choices for cutting sensitive areas. However, you shouldn’t use lower speeds for the thick hair areas such as the back or stomach of your poodle. They are not enough powerful. In general, a dog clipper offers 1 speed, 2, or even 5-speed options. In fact, not all speeds settings can work similarly. For instance, there will be more friction if you use higher speeds. They also can heat up faster. Sometimes, you have to change blades. It’s best to experiment in order to get the best for you. When grooming your dog, ensure to keep him comfortable and stable to prevent him from jumping off a table. The area you choose to groom your poodle should be big enough to keep him. Next, it’s important to make your furry friend used to the clippers before you grooming him. To do this, you can let him see and smell the clipper first. Start to trim gradually. First, start cutting small areas. It’s a good idea to give your dog some treats. By this way, you can make him comfortable with the clippers. Only when your dog feels comfortable, you can make the grooming smoother a lot. Often check for the heat of the blades. Once you feel they become too hot, it’s time to change by a different blade. Otherwise, your dog may get burned. When you decide to cut around your dog’s paw or eyes, it’s important to use a pair of safety scissors because these equipment are fast. Remember to cut with very light pressure when cutting along your dog’s face. Another area you need to cut carefully is around the muzzle. You should stretch the skin to avoid hitting your dog’s canine. There are many things to think about when choosing a dog grooming kit. As a pet owner, you want to get a safe as well as an effective kit for your pet. This product is easy to use. You only need minimal maintenance. It offers 5-speed settings for you. So, it’s perfect for many coat thicknesses. Moreover, this clipper comes with the anti-slip grips. So, it helps to decrease the chance of the kits slipping from your hand. Plus, this option has 6 unique options in colour. However, carefully use this clipper because it can heat up quickly. Sometimes, you need to turn off the clipper for a short time in order to cool it off. To avoid this issue, consider using a slower setting. This product doesn’t provide you with a warranty. Many pet owners choose this product because it’s a compact dog clipper. This option is known as one of the most high-quality products. It promises to give users the best results. It offers a powerful motor. There are available in 2 speeds to choose. It comes with a detachable blade. However, this product is heavy and bulky. So, you may feel tired when holding it on the hand for a long time. Plus, it has a 12-feet long cord. So, it allows you to groom around all part of your dog’s body. This product also becomes hot quickly. But, it’s easy to clean for the maintenance. You can choose the Oster A5 for all dog breeds, horses, cats, as well as other large animals. By grooming your poodle, you can take care of his hygiene. Before start clipping, don’t forget to brush and bathe your poodle. This purposes to make sure your dog feel comfortable before clipping process. The Wahl Lithium Ion Pro Series product is a good choice for dogs with thin to medium coats. Many pet owners choose this clipper because of an array of accessories. This unit allows you to use for 2 continuous hours. But, you need to take 15 minutes to charge it. This is an ideal choice for people who need a reasonable model. However, it’s quite loud. Therefore, your dog can feel discomfort with the grooming process. If you are finding a clipper for the perfect finish, this product is highly recommended. It’s quite a clipper, so you can easily use it to cut your dog’s hair with less noise. It provides you with a warranty for 1 year. Just like the model mentioned above, you can use this clipper for most dog breeds. Even, you can use it for cats as well as some other animals. Sure, you will be satisfied with it because it offers cool blades all the time. In addition, it’s equipped with batteries and some other accessories, including instructional DVD, brushes, storage case, and so on. For blades, it’s not essential to change them because they are available in different sizes. However, its battery can’t last as long as most other models. You can buy it at a cheap price. The Andis Easy Clip Pro-Animal 7 allows you to cut through your dog’s coat with ease. It’s perfect for owners who want to save money by grooming at home. It’s quite, so your dog won’t feel scared. On the contrary, he can feel calm and relax. It comes with cool blades. Therefore, you can use it without cooling spray. You also needn’t turn it off often to cool it. Because of its detachable blades, it’s not hard to clean and maintain. It weighs 2.5 pounds. That’s why it’s easy to hold in your hand. Plus, the clipper offers a powerful motor for dogs with heavy coats. However, it doesn’t come with an adjustable setting. With a good dog clipper, you can become an expert groomer. On the contrary, you can’t work well without the right tools. Now, you get important info about the best clippers for poodles. Hope they can help you decide for the right clippers. Consider one that suits your needs and budget.